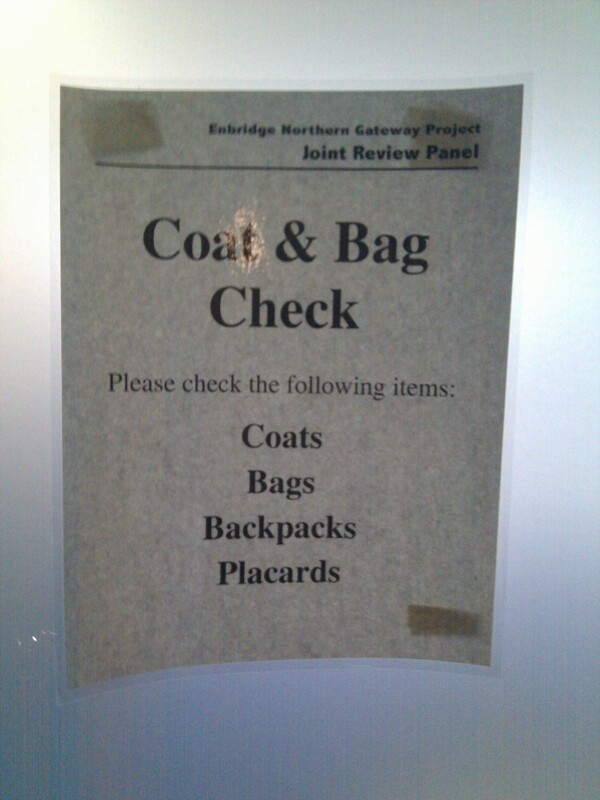 I’m in the waiting room at the Vancouver edition of the Joint Review Panel for the Enbridge Northern Gateway Pipeline. I will shortly be making my ‘Oral Statement’ to the panel. Here is what I’m planning to say. Hi, my name is Hugh Stimson, I work as a geographer and informatics consultant here in Vancouver. I would like to start by thanking you for taking the time to listen to all of us. I think it is right and necessary that it be done, but I don’t suppose it has been easy. Thank you. So we’re making this decision together, a decision about national benefit, and so also naturally a decision about national risk. I would like to ask you a question about risk, and then tell you about some of my own experiences with the benefits. With risk, there are a couple of different things we have to think about: how likely it is for something to go wrong, and what we stand to lose if it does. The pipeline of course is set go through the interior rivers and watersheds and then pass off to tankers on the coast but I’m actually not going to talk about how important those things are to me, about what we stand to lose. I don’t think I would succeed and I suspect many people standing at this portable podium have done a much better job than I could. But I do want to ask about the chances. I’m not a risk assessment expert, but I have to wonder if we’re doing this part right. The proponent will have put a lot of genuine effort into characterizing the chances for this panel. But we keep having regulatory assessments and we keep having disasters that we would never choose. So what have we been doing wrong, and what are we doing differently here in BC? Catastrophes happen when more than one thing goes wrong at the same time. As I understand it, the usual way of estimating the chance of a bunch of unlikely things happening simultaneously is to estimate the chance of each individual part happening, and then multiply all those fractions together to get a smaller chance than any of them. I’m a geographer. The first law of geography says that “everything is related to everything else, but near things are more related than distant things”. That’s true in space, and also in time. Bad things happen in specific places, at specific times. In the real world chances are rarely independent. Chances move together, and when they do, that’s when you get disasters. It wouldn’t be wild and spontaneous chance that the communications equipment on a heavily laden tanker rolling through the Hecate Strait happened to behave unexpectedly at the same time the steering equipment did, and the first tow line failed, and the second. It would be because the same storm was acting on them all at the same time at the same place. Or perhaps a hangover from the same bottle. I’m guessing that interdependence is hard to include in a risk assessment. Human failure is especially hard. I’m sure that the proponents have offered you some characterization of risk. Do you have to believe it? Do you have to make your decisions based on the best assessment they are willing or able to offer? My question to the panel is: however Enbridge is assessing risk, if they used that approach to guess the risks of the Deepwater Horizon blowout ahead of time, or the Exxon Valdez, or the Kulluk running aground, or Battle Creek, do you believe that they would stand here and tell you that the chances aren’t good enough and the project shouldn’t go ahead? I would also like to speak about national benefits. Like a lot of Canadians now I have some experience with the prosperity of oil extraction. My brother who couldn’t find decent work in Ontario recently moved to the Saskatchewan oil patch so he can take up an electrician’s apprenticeship. I got myself established in pricey Vancouver in part using money I made in a Fort McMurray work camp. There are paycheques and some real pride to be had there. A pipeline will to some extent make for more paychecks, and perhaps more pride. But let’s not kid ourselves: that’s not a real economy they have up there. Real economies are built from many kinds of work, not on one resource. Real economies are compatible with the future, not built on this assumption that we will just never start taking the climate very seriously. Real economies are where the parts work together, not one where one part screws up the climate for agriculture or ruins the view for tourism or makes the ski season a crap shoot or opens up timber stands to beetle invasion when the weather warms. The economy we’ve been building all this time here in Canada is not one where young men go away to grow up on coke and loneliness and grown men stand at pay phones in modular hallways draining down their phone cards saying “It’s okay honey, daddy will be home in just two more weeks”. So: you have choices now. If we don’t seem to be good at judging the real risks of petroleum extraction and transport projects, and if the national benefits are not perhaps the ones we want or need, and if the things we’re risking for them are as important as so many people have stood here and told to you in so many ways, I hope you will consider all your options. I hope you will just say: no. Is it a genuine consultation? Do they care? Does this process have a foregone conclusion? Is it a genuine con­sul­ta­tion? Do they care? Does this process have a foregone conclusion? Yes, yes, and yes, as far as I can tell. Yes, yes and yes? Really? I think you just jedi mind trapped my brain. Is that possible? Great post by the way. You are an amazing writer. It just makes me really happy that you made a submission. And that I can read it.